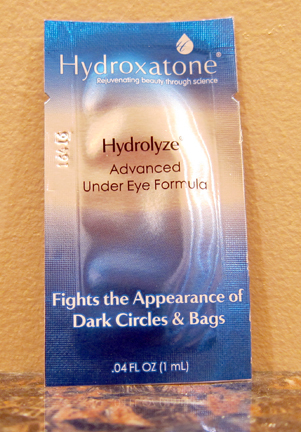 THE SKINNY: Hydroxatone Advanced Under Eye Formula is an under-eye cream that helps brighten those dark circles and fights puffiness and fine lines. It's OK as an eye cream. It was as you would expect, creamy and non-irritating to my eyes. It's made from yeast and botanical extracts. It performed as advertised, but I wasn't blown away by the cream. If I'm going to pay $80 for an eye cream, I want it to be fantastic. And this was just OK.
KEEP OR TOSS: Keep. It's decent, so I'll enjoy the sample and move on to something less expensive. CHECK IT OUT: Hydroxatone offers two related products: Hydroxatone Gentle Milky Cleanser and Hydroxatone Age-Defying Toner.